Announcement After having ALL of our bouquets sell out (yay! ), I'm working on getting more listed this week! If you favorited one that is no longer available, reach out to me and we can always try to recreate it. Thanks so much for the support! After having ALL of our bouquets sell out (yay! ), I'm working on getting more listed this week! If you favorited one that is no longer available, reach out to me and we can always try to recreate it. Thanks so much for the support! This bouquet is beautiful. It goes perfectly with my wedding theme and colors. I’m very happy! Absolutely gorgeous! Can’t wait to use this bouquet for my wedding- it’s exactly what I wanted. Shipping was really fast and the seller reaponded to my messages quickly. A one gal show making lasting intricate and elegant bespoke florals right here in Michigan. I started dabbling in floral design as a kid when I was staying with my Grandma. It was a bonding experience for both of us, and she showed me the ropes as we made bouquets and arrangements together. Since then, I did the flowers for my own wedding in Fall of 2016. With the flurry of wedding planning and preparation, flowers were my favorite part! I loved being able to sit down and create, and let all the stress of the big day fall away. After the high of wedding planning came down, I still could not get flowers off my mind. Since then, I've opened this Etsy shop to begin selling my creations for others to enjoy. I want you to enjoy your flowers as much as I did for my wedding! My goal for you is to give you a beautiful custom bouquet that will last a lifetime. We want you to be happy first and foremost! Please address any issues you have and let us know how we can make it right. We want you to have a beautiful, unique bouquet that will last longer than a few days after your wedding. 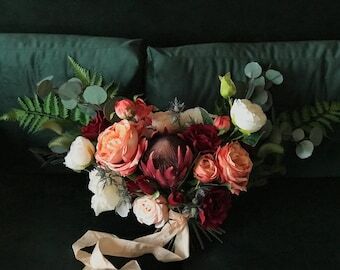 We will only use the highest quality silk, "real touch", or preserved flowers and greenery, as well as high quality glue, ribbon, etc, for your bouquet. Why choose silk flowers? They will last you decades if cared for properly. Your bouquets will be around to show your children and pass it on to others, or to keep and admire. Destination weddings! Trying to coordinate with a florist at your destination can be difficult with currency exchange, communication, and potential cultural differences. You would also have difficulty flying fresh flowers down (or up). With a silk flower bouquet, you can package it up, and it will make the trip without wilting, succumbing to rough handling, or dying. Custom orders are welcomed and encouraged! I would love to create a package to encompass your entire wedding day. I will no longer be accepting requests for bouquets replicated from wedding photos. Rush orders are accepted only on a case by case basis. Rushing your custom order will result in less or no time for revisions. Our creations require time and preparation for the best result. Please contact me to start a consultation and we will create something beautiful for your wedding day! Just a quirky, creative gal making beautiful bouquets. Custom orders are welcomed and encouraged! I would love to create a package to encompass your entire wedding day. At this time, all orders are handmade and designed by me and I will not be taking any orders that are replicating previously made bouquets. I'm happy to use images for inspiration, but I no longer offer replication. Please contact me to start a consultation and we will create something beautiful for your wedding day! Your bouquets will last if cared for properly. They are sprayed with a protective coating to help prevent dust and dirt accumulation. This will not eliminate it completely. You still may need to clean them every once in a while to keep them looking "fresh". I've attached detailed instructions here on a few different methods. We are not responsible for any damage incurred while cleaning your bouquets. Giving a bouquet as a gift? Contact us to arrange gift wrapping!